This is the 1st of a 4-part series called BACK TO SCHOOL. In this series, I discuss the various strategies you need to be successful in life’s classroom. Let me give you your list of school supplies to pick up so you can be successful in this classroom of life. Have you ever heard of the old saying the 3 R’s of learning? Reading, Writing, and Arithmetic? These are the areas on which we are going to get our school supplies. There are so many benefits from reading! And if you really want the life that you desire? You’re gonna have to do what it takes to LEARN about the life you desire. So READ!!!! Even if it’s a page a day, you owe it to your overall wellbeing, and your overall success if you would READ! Study after study shows you will remember things better when you write them down. Studies show that that you become 42% more likely to achieve your goals and dreams, simply by writing them down on a regular basis. With achieving your goals, you must have measurable outcomes. When a goal is specific and measurable, it’s more likely to be achieved. Goals need to be made in such a way that measurable evidence can be accomplished along the way. This is a great time of year for a mid-year checkup, to REFRESH YOURSELF. When you refresh something, you’re enhancing something you already have. You are giving new strength to it. So, now that you’ve reset yourself, let’s refresh ourselves to move forward. Realize that you have the capability to achieve astounding success. Think about one goal that you set for yourself for this year. Resist the temptation to just breeze by your milestones without acknowledging what it took for you to achieve them. You’ve likely done a lot in the past six months, whether it’s personally or professionally. Remember that micro wins lead to macro wins. Understand who you are and who you are becoming in the PROCESS of achieving your goals. When you take the time to reflect, and be mindful, you learn more about yourself. Even if you have not made the progress you would’ve liked to made towards your goals, I’m sure you have learned lessons you would not learn otherwise. And you know what? Those lessons are sharpening you for future endeavors. Refresh your mental position. Let’s do as Lisa Nichols say do and move to another mental zip code. You see, energy grows where energy goes. So take on the mindset that you are moving from a position of setback and defeat to a position of success and achievement and happiness. Start thinking like over-comers, start thinking and start talking like successful people talk. How do you know when it’s TIME to reset? In this episode, I give you 3 signs when it’s time to press that reset button. Reason #1: It’s time to reset because you’ve realized that you’ve lost your passion for the goal you initially wanted to achieve. Remember, when you’ve lost your PASSION for something, your commitment level decreases. Be honest with yourself. Maybe it’s time to reset your purpose and your goals because you’ve lost passion. Reason #2: It’s time to reset when your actions are counteractive to your overall goal. In other words, if you have developed a behavior that is not helping you reach your ultimate purpose, you need to reset your life. Ask yourself this question, what am I doing that’s pulling me further away from achieving my goal? Than ask yourself this, what can I do to change that behavior? Reason #3: It’s time to reset when you‘re not in harmony with yourself and others. This usually takes place when you’ve isolated yourself either physically, mentally, or emotionally from others. We actually NEED to be part of a community in order to thrive. Do you find yourself becoming more isolated on your journey? Who is your support community? Find some time to check in with your support team to make sure you’re in harmony with yourself and others. Remember, you can still pick yourself up, dust yourself off, and restart. For this podcast, I share with you 3 main principles for you to REFLECT to RESET. My principles are based on the principles used by Master Coaches Jacqui Phillips and Karl Romain. Apply these principles to where you are on your journey of success. Apply them to reset your life for long-lasting and positive change. In order to reset your life you must ACCEPT the truth about yourself, particularly in the areas in your life that need a rest. For instance, are you a procrastinator when it comes to putting things in place for yourself? Or, are you a perpetual “quitter”? Meaning, you start projects, but you never complete them. Perhaps you’re one of those who NEVER take time for self-care. What are some goal hindering areas in your life do you need accept?After you have accepted whatever that area is, address it and start making improvement. Those of you who know me, know that I teach ACTION!!!! Remember the scripture faith without works is dead? There’s another translation I love that poses the same statement as a question. It says, what good does it do if you say you have faith but do not do the things that prove you have faith. In other words, what good does it do you to have goals and aspirations, but you don’t take the action steps to prove that your goals and aspirations are worthy?!?! No action, no change. It’s that simple! Being accountable is perhaps one of the main principles that fuels successful people. You know why? Accountability eliminates the time and effort you spend on distracting activities and other unproductive behavior. When you make people accountable for their actions, you’re effectively teaching them to value their work. If you can’t be accountable to yourself, then find a dependable friend or get you a coach to make sure you are not distracted from your goals. Your accountability will allow you to experience your RESET mindfully and to make the decisions you need to create the change in your life you deserve and desire. Remember, the reset button is always available for you to press. Never underestimate the power of resetting your life. Episode 20 “Pruning to Spring” is the 3rd part of the SPRING FORTH – DO SOMETHING NEW series. Just as it is healthy to prune shrubs and trees so that they may grow, we also need to prune areas in our lives so that we can make way for new ideas and fuller growth. In this episode, I offer you 3 rules of pruning and how you can apply these rules to your life. Rule #1 – You should prune to improve your appearance and overall landscaping. Do you have anything or anyone who’s a part of the landscape of your life that ‘s hindering your growth in any way? What about undesirable structures that take away from the appearance. Are you ready to take a step in pruning that person or area? Rule #2 – The timing of when you prune is EXTREMELY important. There are times when it seems like absolutely no growth is going on in our lives. This is actually the perfect time to take a look at your surroundings and your inner circle to determine who and what needs to be cut off. Rule #3 You must use the right tools for pruning. You need the tool of stillness and meditation, so you can listen intuitively to what your inner being is telling you. Too often we’re so caught up with people, things, and activities that it’s actually a challenge for us to determine what EXACTLY needs pruning. You also need the tool of healthy communication so you can get across the true sentiments of your pruning process, especially to those who will be affected. Remember, growth ALWAYS require pruning. What conversation do you need to have in order to prune a particular area in your life? What is keeping you from having that conversation? When will you be able to take steps toward pruning so you can spring forth? Episode 19 “Create a New Community” is the 2nd part of the SPRING FORTH – DO SOMETHING NEW series. In this episode, I offer you the suggestion of creating a new community when you don’t quite know WHAT new thing to do. In an earlier podcast, I stated that when you look at the quality of your current situation and don’t quite like what you like – you need to try something new. Let me give you a suggestion of what new thing you can do to improve the quality of your situation. CREATE A NEW COMMUNITY!! That’s right, create a new community! I didn’t say dump your old friends for new ones. I mean find someone, someone new, or maybe a few NEW people who are like-minded, who are forward-thinking, people who are aligned with your goals and aspirations. When you connect with someone new for the purpose of propelling your life forward, here’s what happens, you will begin to see, hear, and experience new ideas, new achievements, and new success. Episode 18 “No More Excuses” is the 1st part of the SPRING FORTH – DO SOMETHING NEW series. In this episode, I discuss 3 reasons why we use excuses to keep us from trying something new. Reason #1- We haven’t made what we REALLY want, a priority. If you want to see a shift in your life from being stuck to experiencing authentic happiness and fulfilling success? You have to get to a place of doing something new. But don’t just SAY you’re going to do something make it a PRIORITY in your life. The things in your life that you make a priority are the things that you do not make excuses for it. Reason #2 – Ee fear failure and it’s difficult to accept responsibility when we fail. I honestly believe that our culture doesn’t really teach us to be comfortable with failing. In fact, many of us fear failure! Failing is part of the process of trying new things. However, when we DO fail, we tend to blame other people and/or elements as the reasons behind our failures. Reason #3 – We lack the discipline to sticking to the new thing. What you want or don’t want to do is presently irrelevant – it’s the end goal that matters. The reason you stay DISCIPLINED in doing this new thing is because you WANT to see the results of your work. Being disciplined is just remembering what it is that you really want. Remember…7Stepping out of your comfort zone and trying new things is the best way to grow. Episode 17 is the 4th part of the GROWTH MINDSET series. Have you been thinking about doing something different, something new? For this week’s episode, I offer to discuss how having a GROWTH MINDSET makes it possible for you to SPRING FORTH and DO SOMETHING NEW! One of the traits that successful and happy people have in common is that they escape the STUCK TRAP by taking risks and doing new things. Ten years from now, or maybe even 5 years from now, what will you wish you had done during THIS period of your life or your career? Now, what is the ONE thing you can do to take a step in the direction of doing that something new? Don’t wait, go for it! Episode 16 is the 3rd part of the GROWTH MINDSET series. For this week’s episode, I offer ways that you can flourish in your current condition, even if it is not your ideal situation. Strategy #1: Examine your character. Our character is the aggregate of who we are; thoughts, feelings, and behaviors it’s “what’s inside every one of us.” A great resource for discovering your strengths is the Character Strengths Survey. Take this survey, and once you’ve pinpointed your strengths, think about how you can use them to the best of your ability. This way you can spend less time dwelling on the things you don’t like about yourself and more time living a fulfilling life by emphasizing the parts that you do like. What makes us adaptable? One primary way of becoming more adaptable is to improve your coping mechanism. Your coping mechanism is what you usually think or how you usually react in the face of stress or trauma to help manage difficult emotions. Many of us start whining or complaining as soon as we find ourselves in a difficult situation. Some of us lash out at others and blame them for our current situation. Although it MAY be a normal reaction for most of us, it ultimately leads to nowhere. Learn to accept the situation, ADAPT to it and move on. Episode 15 is the second of the 4-part series on A GROWTH MINDSET. For this week’s episode, I discuss RESILIENCE. Resilience is the ability to bounce back from setbacks. It is also the ability to thrive, grow and be effective in the face of adversity, challenges and change. People who have a growth mindset possess the trait of resilience. Resilient people think differently. Resilience can be learned because resilience is primarily about how you think. The interesting thing about resilience is this… EVERYBODY needs it. Whether you are dealing with bad traffic, or a major challenge such as a negative health diagnosis, job loss, divorce or financial setback. You need resilience! Because you know what? Stress, challenges, and adversity are inevitable. As I said earlier, resilience is primarily about HOW you think! This is what psychologist call building your self-awareness. And the best way of building self-awareness is by taking time to notice your thoughts. If you can be aware of your thoughts, you can change them and ultimately change your reactions to the challenges and adversity that comes your way. You do this by shifting your perspective. When you shift your perspective you stop irrational thinking, you reduce anxiety and increase productivity. I want you to think of a recent situation that has caused you heightened stress, anxiety, and/or frustration. Describe the who, what, when, and where of what happen. NOT THE WHY. Just the who, what, when, and where. What were your thoughts during that moment? What was your reaction or response? Was your response healthy? Did it bring you closer to your goal? Or was your response counteractive to your goal? If this event were to happen again, how would you modify your response? Remember, your thoughts create reactions. If you can be aware of your thoughts, you can change them and ultimately change your reactions to the challenges and adversity that comes your way. BE RESILIENT!!! Episode 14 is the first of the 4-part series on GROWTH MINDSET. For this week’s episode, I discuss the difference between a growth mindset and a fixed mindset. I also offer three practices that you can implement to develop a growth-mindset. Valorie Burton says fear uses perfection as an excuse for remaining stuck! You see, perfection and procrastination are relatives. We often procrastinate because we are not in the perfect situation or we may feel inadequate for the task at hand. What do you keep putting off because the circumstances aren’t what YOU think they should be. Give yourself permission to make mistakes, and to LEARN from those mistakes so you can move forward. Be open to learning something new! A fixed mindset literally switches us off to learning. In contrast, the growth mindset means that you realize the importance of remaining open to new experiences and information. Have you been putting off learning a new skill or a new practice to help you especially one that will help you fulfill a goal? Failure isn’t final!Avoid the fixed mindset trap by learning to view failure as a temporary setback rather than regarding it as being all defining. People with a growth mindset still experience failure and disappointment, but don’t allow setbacks to deter them from their goals. Do you feel like you’ve failed at something recently? What did you learn about this temporary setback? How can you get back on track with your progress? Episode 13 is the last of the 4-part series on LETTING GO. Examine your own actions. Do you have a tendency to micromanage? If so, What are some reasons behind your micromanagement? Do you not trust others to take responsibility of a specific task? What do you fear if you let go of controlling certain aspects of your relationships or career? Take a moment in your quiet space and time and answer these questions truthfully. I’m sure your answers will shed some light on what you really fear. Spend more time focusing on the areas where you DO have control. Remember earlier we discussed those areas, your health, attitude, your mental and emotional well-being? What would your life look like if you devoted more time to your health, mental, and emotional well-being, instead of spending more time TRYING to control other people’s behaviors and actions? I’ll tell you what will happen, you will become more productive and less stress. Learn to become more flexible. Learning to adjust to life’s circumstances beyond our control is a core trait of having a more enjoyable life. According to psychologist Dr. Sandra Sanger, When you need to have control, “you sacrifice flexibility and place a lower than necessary ceiling on your capacity for engaging in and enjoying life.” In other words, people who have difficulty letting go of control oftentimes find themselves missing out on other enjoyable areas of their lives, because they are simply using time and energy engaging in areas in which they have no control. This week’s episode is the third of the 4-part series on LETTING GO. Toxic people rarely take responsibility for their own negative behavior. Toxic people are rarely supportive and interested in other people’s goals and dreams. After hearing the three common traits of toxic people, do you find yourself in some kind of relationship with a toxic person? Sometimes, letting go of toxic people means that you’re actually letting go of their BEHAVIOR, not necessarily letting them go as human beings. Let’s face it, there are people in our lives that we can’t literally “let go” because of the role they have in our lives. For many of us, it’s a family member, a colleague, or co-worker. Maybe you have toxic people in your lives that you just can’t let them go, but you can let go of their toxic behavior. You do this by setting healthy boundaries for yourself. In fact, setting healthy boundaries is the way of letting toxic people go. Sometimes that means making the hard decision to distance yourself from those whose presence is more likely to keep you stuck than moving you forward. It may simply mean having a heart-to heart discussion about what’s not working for you in your relationship or friendship. It may even mean you taking ownership for accepting theis behavior and taking action to change YOUR role in the relationship or friendship. Remember… iron sharpens iron. If you want to live a life of success and happiness, you need to make sure you become be the iron you want to attract. This week’s episode is the second of the 4-part series on LETTING GO. For this week’s episode, I discuss “Letting Go of Your Old Story” by offering you a template for rewriting your own story. First, give yourself the starring role, not as a victim, but as an overcomer. Do not make the villains the centerpiece of your story. Next, choose a cast and crew. Choose people who bring out the best in you. Choose someone who stretches you and challenges you to do better. Choose someone where service is reciprocated and is not one sided. Finally, practice telling this story, first with yourself and then to others. In the words of Steve Maraboli: Letting go means to come to the realization that some people are a part of your history, but not a part of your destiny. What does your happiness have to do with success? Here’s a fact: Research shows happiness causes success, not the other way around. This week’s episode is the first of the 4-part series on LETTING GO. For this week’s episode, I discuss 3 common negative emotions – anger, fear, & guilt/shame and possible messages they send. I then offer you questions of self-reflection so that you can take steps to move forward. Possible Message: Someone crossed your boundary. Questions of Self-Reflection: What can I do to move on from my anger? What could I do differently to reduce the chance of this happening again? Possible Message: I may be focused more on the potential for a negative outcome than a positive outcome. Questions of Self-Reflection: What if my fear came true? How would I overcome it? Possible Messages: I have done something that is out of alignment with my values and beliefs. Or, I am allowing past actions or experiences to define who I am. Do I need to seek forgiveness from others or myself? How can I ensure that I won’t repeat this in the future? What can I learn from this mistake or failure that will help me behave differently in the future? This week’s episode is the fourth of the 4-part series of LOVE AND HAPPINESS. I’ve entitled this podcast “Sustaining and Maintaining Your Happiness”. you should implement to KEEP your happiness. Spend your resources on activities that produce positive emotions.You see, we gain the most happiness from experiences that create specific positive emotions: joy, delight, contentment, peace, enthusiasm, curiosity, vitality, pride, interest, thrill, and even connection. Don’t become mundane and predictable in your happiness habits. This is why changing your circumstances (10%) is ineffective for sustainable happiness. By nature, we adapt to our routines, so we have to change even when our circumstances don’t. Periodically tap into a social support system that will hold you accountable and support you towards your happiness goals. People with social support are even more likely to sustain happiness when they intentionally want to create more of it. Make a commitment to take part in activities that make you a happier person. You must commit to this goal of being happy for a long period of time, maybe even a lifetime. #5. Repeat! Repeat these practices over and over again until they become second nature to you. When you repeatedly take conscious actions, you form habits. Habits form with repetition and practice until they become “habitual.” You don’t even think about them, you just do them. And that’s the goal of sustainable happiness. 1. Write down 3 blessings, or 3 areas of gratitude. 2. Perform a random act of kindness for someone. 3. Do something positive for yourself that makes you happy! 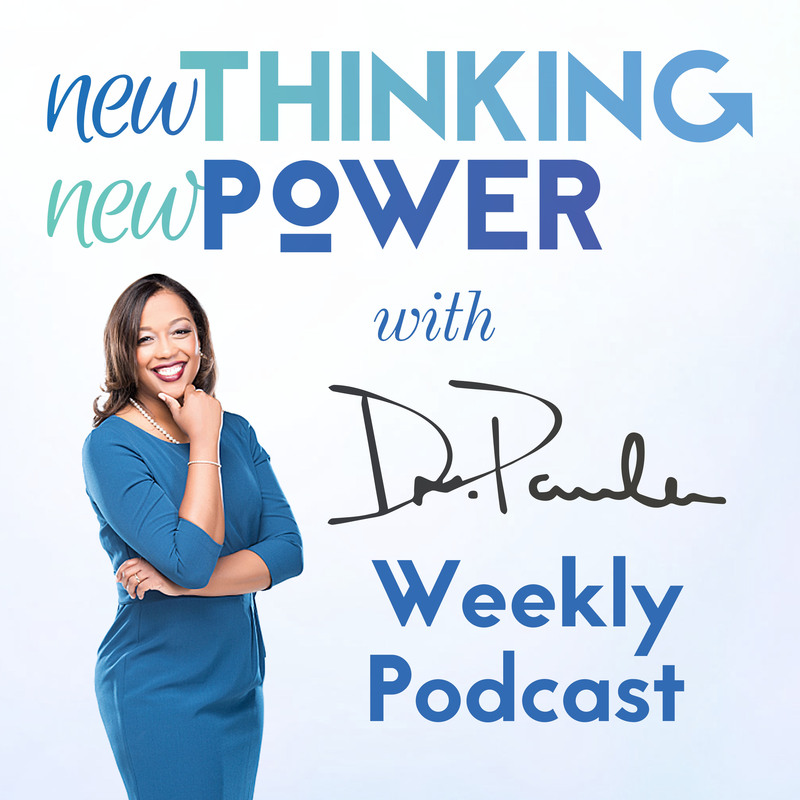 The New Thinking New Power Podcast is a weekly chat with Dr. Paula, a certified life and executive coach in Atlanta, Georgia, where she discusses all things related to reconstructing your thoughts so you can attract success, happiness, and more importantly, the life you desire. This week’s episode is the third of a 4-part series of LOVE AND HAPPINESS. I’ve entitled this podcast “Happy Habits”. What does your happiness have to do with success? Here’s a fact: Research shows happiness causes success, not the other way around. For this week’s episode, I give you 5 habits for developing authentic happiness. Habit #1: Develop a habit of positive thinking. What is a more optimistic way of looking at your current situation? Habit #2: Develop healthy social connections. How connected do you feel to those who support you most? Habit #3: Manage the negative occurrences. What do you need to do to relieve your stress and anxiety levels in a healthy way? Habit #4: Live in the moment. Do you take time to celebrate small milestones? Habit #5: Make attainable goals. What is your most important goal currently? What is one step you can make to get closer to this goal? 3. Do something for yourself! This week’s episode is the second of a 4-part series of LOVE AND HAPPINESS. For this second episode of the series, I have special guest author, motivational speaker, and spiritual leader, Dr. Sean Cook. Our topic of discussion is “Legacy Your Love Legacy”. Where to find Dr. Sean Cook? This week’s episode is the first of a 4-part series of LOVE AND HAPPINESS. For the first episode of this series, we discuss the “ABC’s of Self-Love”. A: ACCEPTANCE. Accept your whole self NOW and unconditionally, but knowing there is more of you that is growing, developing, and evolving. B: BOUNDARIES. Setting and maintaining healthy boundaries is imperative for your self-love. Setting AND maintaining boundaries tells people, how they should treat us. But it also tells others how we treat ourselves. C: CUSTOM. C: Create a CUSTOM of self-love. In other words, create a tradition or a behavior of doing something specifically you and for you. In this episode, Dr. Paula summarizes what she’s discussed in the January podcast series Resolutions to Revolutions: Setting the Goals You Want and Getting the Goals You Set. DO learn to talk to yourself in a positive voice. In other words, speak positive affirmations. What do you say to yourself (aloud) to affirm yourself? DO mentally rehearse what you say or do when you encounter a blockage or a challenge or an obstacle on your journey. Mental rehearsal occurs when you practice in your mind the language or action when faced with a hypothetical situation. DO recall previous successful goal pursuits, particularly when you feel stuck or in a jam. Recalling what you have successfully achieved in the past serves as a reminder of your ability to overcome current obstacles and challenges. DON’T stick to a blocked goal when it is truly blocked. There are times when a when you just can not surmount the challenges and blockages that come about during the pursuit of your goals. And it’s ok.
DON’T think you can reach your big goals all at once. The key to achieving your big goal is patience, perseverance, and pacing. Break up that big goal into smaller attainable goals. DON’T engage in self-pity when faced with adversity. Surround your self with a coach, an accountability partner, or a support group that does not allow you to wallow in misery when you THINK you have been defeated. Your temporary set-back could be a set-up for your next victory. Goal fatigue is a concept developed by sociologist Roy Baumeister, a professor at Florida State University. He is the co-author of, the book Will Power. He says that goal fatigue is the tiredness and exhaustion that results due to the concentrated energy and effort used to accomplish a goal. Therefore, without proper time to replenish that energy, there is less available for the next task or goal. When it comes to goal fatigue, the best thing you can do is acknowledge it, and address it BEFORE you get to the burnout stage. Here are some signs that will tell you if you are experiencing or on the verge of experiencing goal fatigue. The first sign you should watch for is whether or not you are uninterested, unexcited, and exhausted by activities and events you once loved. Think about the goal or the goals you have set. Does this goal still intrigue you like it intrigued you the day you set it? The 2nd sign that you should watch for is that you are not giving your full attention to any one goal, and it is showing. Do you give yourself time to recover between tasks and other smaller goals? The 3rd sign that you should watch for is this. You don’t take the time to celebrate your small achievements. When was the last time you celebrated a SMALL achievement? Lisa Nichols, the author of Abundance Now, advises us to set ourselves up for micro wins—and build those into macro wins. Here are some helpful, research-based facts that can serve as tools for getting to the goal. Tool #1 – Self-efficacy: You must believe you can do it. Tool #2 – Specificity: Make the goal vivid and specific. Tool #3 – Flow: Set goals that stretch you, but don’t break you. Tool #4 – Training and Experience: Make skill development a part of the goal plan. Tool#5 – Commitment: The more specific and difficult the goal, the greater the commitment required to reach it. Tool #7 – Feedback: To effectively reach a goal, get feedback to help you sharpen your strategy. A goal is anything you desire to experience, create, get, do, or become. What does your goal tell you about your values? What is motivating you towards your goals? What do you need to give yourself permission to hope for? The Via Survey of Character Strengths is a simple self-assessment that takes less than 15 minutes and provides a wealth of information to help you understand your core characteristics. Take a free personality assessment and discover what really drives you.